Whether a simple plunge pool or a resort-level backyard oasis, creating the perfect fit for your lifestyle can be made simple with a good plan. Creating a pool space in the backyard is an investment, and when designed and crafted well, the results are absolutely worth every penny. As a matter of fact, we invite you to browse through our photo gallery of before and after pictures showcasing some of our projects. If you are ready to tackle your swimming pool landscaping project, you will find this blog post very helpful. Our professionals at Outside Landscape Group love creating beautiful, functional backyard swimming pool areas. Whether simple or more elaborate, we can help you make sound decisions and offer options throughout this process. If you are currently in the brainstorming phase, you’ll love these 5 ideas for landscaping the areas near your new swimming pool. Do you want family and friends to be blown away when they walk in your backyard? We can create this type of swimming pool landscaping for you. Homeowners who want an elegant backyard and are considering a more dramatic feel can accomplish this with added landscape lighting and waterfalls. The combination adds excitement both day and night. 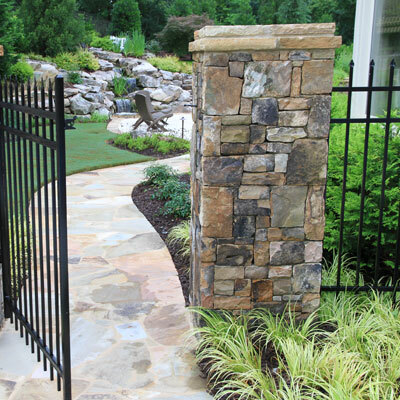 Outside Landscape Group is trained and experienced to implement these great ideas. Check out our landscape lighting page. Check out our water features page. When you browse through our photo gallery, you’ll see that many of our clients opt for landscape designs for pools that incorporate a waterfall. This provides an excellent touch to your swimming pool area. For the best, most natural results, it is important to place the waterfall in a setting that looks appropriate. Our professionals are trained to create this concept with artfully sculpted soil, strategically placed boulders, and set in a lush, planted backdrop. Homeowners absolutely love the sound and the look of moving, running water—why not incorporate that into your backyard? Do you love palm trees? Do you love resort or spa retreats at the beach or an island vacation? If so, a tropical swimming pool landscape would be a great backyard oasis for you. Our professionals can help you design your tropical retreat. Tropical backyard themes also typically include hardy palms, natural stone accents, colorful vines, tropical plants, comfortable seating options, a fire pit, a lot of green trees, and large-leafed plants. Dramatic decking can also enhance your tropical backyard retreat. Outside Landscape Group can help you with all of this! We don’t know too many people who don’t want to relax after a hard, long day of work. We also don’t know too many people who refuse to relax at some point in their busy lives. A peaceful, serene backyard may be just what you need. An irregular-shaped or natural-shaped lounging pool surrounded by comfortable lounge chairs within a private setting can accomplish this goal. The “lagoon look” is both artistic and functional. Natural swimming pools can incorporate natural materials, such boulders and stone, deeper blue colored water, and a more loose, natural look to the landscape. Choose a natural swimming pool surrounded by lush, green gardens and you’ll never want to leave your backyard. Fire-pits and fireplaces are a great addition to any design. It allows for year-round entertainment around the pool. There is nothing like sitting poolside on a cool fall night with a warm fire and a great view. Incorporating a fire element adds a great additional entertainment feature to the backyard. An entertaining area is essential to any swimming pool space. Many of our clients choose a swimming pool landscape where swimming and outdoor entertainment are combined. This concept can include outside kitchens, built-in seating areas, relaxing outdoor furniture, and more. 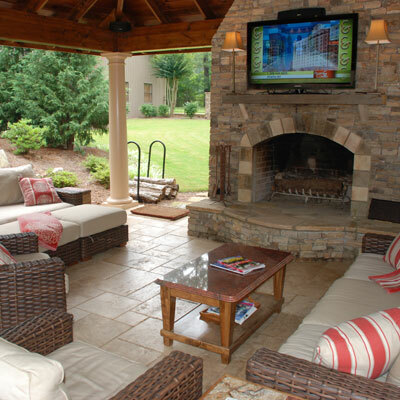 We can re-create your backyard to fit your entertainment needs. The first step is to call us! When designing your backyard swimming pool, there are so many options nowadays, and our professionals will help you sift through to find the best one for your outdoor space. DO YOU WANT A CUSTOM-SHAPE SWIMMING POOL (I.E. KIDNEY-SHAPED POOL, OVAL, ETC)? Do you want a custom formal pool or a unique shape? Some people choose to go the unique route to bring some character and custom design into their backyard space. If you are interested in a custom pool, we can show you examples of different pool shapes to choose the best one for you. Pool shapes can include: oval, kidney-shaped, circular, curvilinear, rectangle, and many more. The rectangle shape is a common, simple one. You’ll also want to determine the maintenance required for each type of pool. DO YOU WANT TO HIRE A “LANDSCAPE ARCHITECT” OR A POOL CONTRACTOR? You can start with either a landscape architect or a pool contractor to design and implement your backyard swimming pool landscape ideas. We have professionals on our staff who are well trained and experienced to deliver a wide range of custom ideas. We have before and after pictures to prove it! Although there are very talented pool contractors out there, we believe working with a landscape architect will allow you to consider both the pool and all the surrounding features at one time, leaving no stone unturned. WHAT TYPE OF POOL PAVING MATERIAL WILL YOU USE AROUND THE POOL AREA? One thing you’ll want to decide, and we can help you with this decision, is the type of paving material to use in the area surrounding the pool. If you have young children or elderly folks coming to visit, you may want to use a slip-resistant paving material for the areas that people will walk on with wet feet. Another consideration is the pool deck temperature and the feel while stepping. The various colors and textures of material, as it relates to sun and heat, make a big difference. Pool areas are a barefoot environment and a pool deck material selection is key to enjoy the outdoor experience. 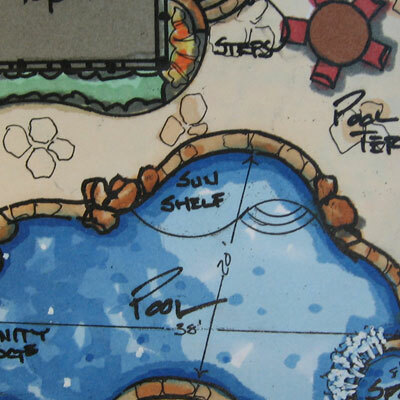 There are many things to take into consideration when designing your pool area, and we can help with all of it! This is something important to keep in mind. A lot of yards have some form of fencing around the perimeter, but the type and location are key. Pool fencing is a great safety feature and most often varies with requirements based on your city location. Let us help you figure out the best plan for your yard. DO YOU WANT ANY CUSTOM CARPENTRY PIECES FOR YOUR POOL AREA? Custom carpentry for your outdoor space can surely provide that wow factor people love. 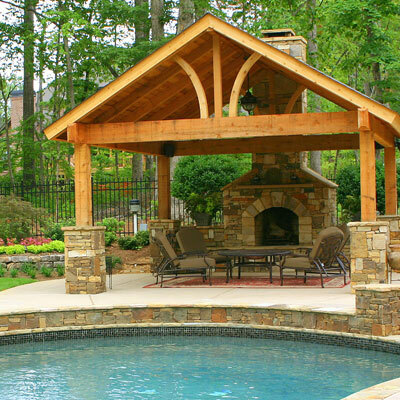 A beautiful, custom-built pergola, for instance, will add character to your swimming pool landscaping ideas. We build artistically-defined custom carpentry for our customers all of the time. You can see some pictures in our photo gallery on our website! WHAT CAN OUTSIDE LANDSCAPE GROUP DO FOR YOU? WHAT IS YOUR NEXT STEP? If you love any of these 5 creative ideas, we can surely make them happen. If you are interested in learning more about everything we have to offer, give us a call. Call us today to schedule your consultation appointment to learn how we can help you create the backyard of your dreams. That is the next step to revamping your dreary backyard so you can start enjoying your home much more than you ever have before.